Blue House Needle Primer [G7265] - $24.00 : Yarn Tree, Your wholesale source for cross stitch supplies. Cross stitch pattern by With My Needle. A cozy, large two-story home, sits nestled between pine trees. Inside, the family is gathered around the fireplace with conversation & reminiscing. Giggles can be heard from the children in the next room. "This I did that you can see what care my parents took of me," is stitched above the home. Love is in the air, as small red hearts are stitched next to the trees. The back of the wooden hornbook features the alphabet stitched at the top with two small hearts, one in each bottom corner. Included with this design, is a wooden form in the shape of a hornbook. 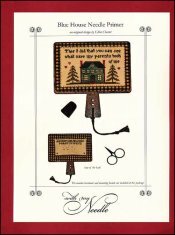 Stitch counts: Hornbook front is 72W x 44H & Needlepage is 63W x 35H.